Wow! It is April already and the first quarter of 2018 turned out to be another back-to-back great quarter for our industry! Even better – first quarter 2018 was better than first quarter 2017! On what do we base this statement? Tax Cut and Jobs Act of 2017 has made it easier for entertainment centers to get funding and more are opening. In general, more businesses are borrowing more money and hiring more people. Here is what these businesses are doing with this money: choices – hiring more people and expanding; giving raises to key staff; upgrading facility, paying down debt, (stronger balance sheet), and some are putting some of the money into the owners’ pockets. More industry ads are being placed by games manufacturers that focus on how important the games are to the success of the average family entertainment center (FEC). More industry articles stating that updating the games and rotating in different games keeps the customers coming back; that decent food is a must these days because when people leave their homes they want to eat and also have a fun experience and it all better be at a discount price for a much-higher perceived value. The point here is – the pizza has to be good pizza. 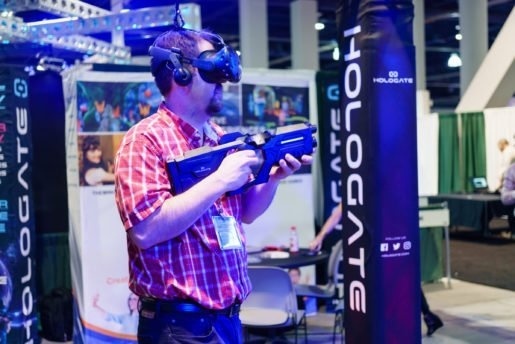 More than 50 percent of Amusement Expo attendees wanted to learn more about virtual reality (VR.) There were six companies showing VR systems and the one Frank Seninsky liked best was Hologate 4 Player by Creative Works. Participants in February’s National Independent Concessionaire Association (NICA) show reported brisk buying. The IISF Gibsonton Show also reported a positive event. March’s Amusement Expo 2018 offered best-in-decades seminars and the Laser Tag Convention also featured a full day of seminars. But it was virtual reality (VR) that generated the most interest with many people attending the VR seminars. Our takeaway is that we will see more future generations of VR before this new sector gains traction (20 percent market-share), but VR is clearly a direction for the future. Laser Tag. There are 1,200 laser tag attractions in the United States. The future looks great for laser tag as trampoline parks and theaters are two major sectors that will be adding laser tag to their mix. Escape Rooms . Revenue figures are starting to come in from A and B locations and some of the escape rooms are grossing $2000 a week ($100,000 a year) which is more than they cost, so that is a good thing. Virtual Reality (VR). More than 50 percent of the attendees wanted to learn more about VR. There were six companies showing VR systems and the one I (Frank) liked best was Hologate 4 Player by Creative Works. They have more than two dozen systems out already and the average revenue is coming in and projected at $100,000 a year. This is also more than the system sells for, so a 1:1 ratio is acceptable. Calories Count. Laser Tag is now counting calories. The 3, 000-square-foot Laser Fit has opened in downtown Los Angeles. The customers are adults, as not many kids are interested in this. That is too bad, as it could be a good thing for children and teens. The Laser Tag Museum. Eighty-thousand people per year visit the Laser Tag Museum. International Laser Tag Day. International Laser Tag Day is March 28. Free posters were available by contacting Erik Guthrie at erik@lasertag.com. The Retail Apocalypse Seminar. There are 1,000 big box stores and 4,000 medium-size box stores available for the FEC industry at great prices as retailers close and continue to close stores across the United States. Millennials. Millennials have a spending power of over $200 Billion, and 80 percent want to work for a company that cares about its environmental impact, eighty percent view themselves as leaders and 90 percent check their texts, emails, and social media before getting out of bed each morning.